Adam Szymkowicz is a mad man — a mad man playwright with a dream to interview every playwright he can get his hands on. So he’s not a mad man you have to be scared of. He’s the good kind of mad man, like Edison or Bell or Einstein or…Batman. 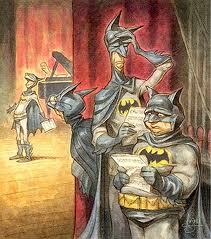 That’s it: Adam Szymkowicz is the playwright Batman. And I’m his latest interview. Check out his work too while you’re at it. His play Incendiary has 3 more performances at Wishbone Theatre Collective in Chicago. Tell your friends. Tell your enemies. Then get yourself to Los Angeles for the limited run. The World Premiere of Down in the face of God. Written by Tim J. Lord. May18 – June 2, 2012. Presented by AthroughZ Productions. Directed by Caitlin Hart. Movement & Choreography by Doug Oliphant. Featuring Dan Amerman, Sam Bianchini, Andie Bottrell, Matt Harbert, Christina Jun, Eric Martig, Lauren Terilli, and Meredith Wheeler.